***DISCLAIMER*** The following review is entirely my opinion. If you comment (which I encourage you to do) be respectful. If you don't agree with my opinion (or other commenters), that's fine. To each their own. These reviews are not meant to be statements of facts or endorsements, I am just sharing my opinions and my perspective when watching the film and is not meant to reflect how these films should be viewed. Finally, the reviews are given on a scale of 0-5. 0, of course, being unwatchable. 1, being terrible. 2, being not great. 3, being okay. 4, being great and 5, being epic! 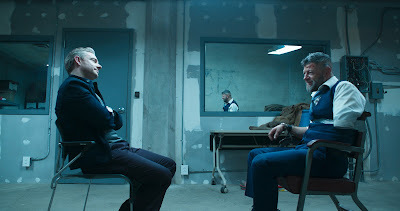 And if you enjoy these reviews feel free to share them and follow the blog or follow me on Twitter (@RevRonster) for links to my reviews and the occasional live-Tweet session of the movie I'm watching! Don't be surprised when the comic book fan in your life says they don't like this film. There's a good chance that it's more out of the fact that comic book fanboys are never happy with their fandom of choice than it is they are racist and hate seeing a black character take the spotlight. Black Panther was a milestone in comics because he was the first black superhero in mainstream comic books. Even during today's modern and ever progressing times, diversity is still met with hardheads and outright racist remarks from the comic book fanboys, having this character debut in the 60s, where comics where very white and sometimes as overtly racist as some fans are today, was an incredible thing. The character has gone on to have a rich mythology and helped give rise to more black superheroes. After making the jump to the big screen in Captain America: Civil War, Black Panther is now in his own film, the eighteenth film released in the MCU. Expectations were high and the anticipation for this film was feverish (you know, because as much as certain members of the fan community and the industry want to deny it, representation DOES matter). Even I was going out-of-my-head nuts for this one—because I'm a huge comic fan (and a fan of Black Panther—Ta-Nehisi Coates’ latest run was awesome-sauce) and absolutely loving everything that the MCU has brought and has been bringing. Needless to say, the stakes were high but Marvel Studios did it again and delivered an amazing film! A film that didn’t disappoint on any level and also showed how Marvel continues to grow and progress with their stories and films. 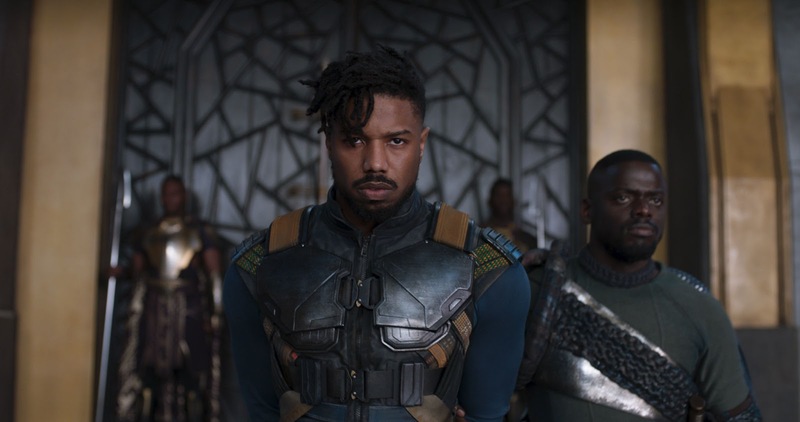 Burdened with the responsibility of being the protector of his land of Wakanda and now the new ruler after the death of his father, T’Challa (Chadwick Boseman) finds his isolated nation under threat. 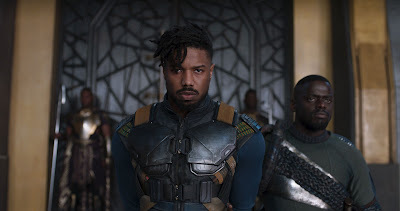 Not only is a ruthless weapons dealer named Ulysses Klaue (Andy Serkis) out to sell the precious and powerful mineral Vibranium—found only in Wakanda—but a mysterious soldier by the name of Erik “Killmonger” Stevens (Michael B. Jordan) threatens the rule of this new king. Now T’Challa must battle to protect not only his kingdom and the throne but for his very life itself as Killmonger seeks to end the man’s life and become the new Black Panther. Black Panther is just an incredible movie and I absolutely loved it. 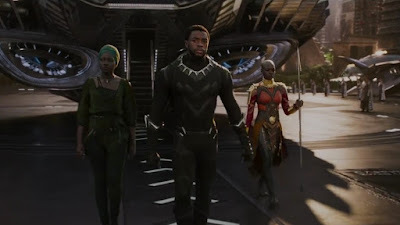 Director Ryan Coogler (who is no stranger to making amazing films) helmed a movie that hit all the right notes for the Marvel formula but also was able to stand out on its own and feel like that, even though it belongs to a larger universe, it still is all about Black Panther and the kingdom of Wakanda. Adding to this vibe, the film delivers on some truly spectacular visuals. The costumes, the sets and the colors all make everything look incredible and unique, and really honors the African culture to a level that no superhero film has ever done. 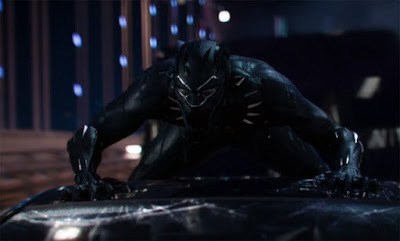 Finally, Coogler and Joe Robert Cole (who wrote it together) crafted a story that honors the source material and the amazing amount of mythology that surrounds T’Challa and his home and does so in a way that never feels overwhelming (because there is a lot going on in the world of Black Panther) but also does it without sacrificing exciting action, some very funny humor, and a whole lot of compelling heart and drama. characters. Yep, we've seen that joke a lot on social media. You can’t talk about this film and not mention the cast. In our society, movies tend to lean more towards the demographic of white, straight and male. I realize I’m in danger of getting a whole bunch of white dudes to “Well, actually” me and talk about the very few mainstream black films in existence but the reality is, no matter what films you mention they are just a drop in a large bucket when compared to how white dudes are represented. Black Panther is a force of nature that brings in some of the best talent the African American community has to offer and they are all just amazing. 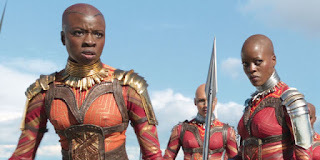 Boseman is badass as T’Challa, Jordan is absolutely incredible as the sympathetic villain Killmonger, Lupita Nyong’o and Danai Gurira are all kinds of awesome as the kickass warriors Nakia and Okoye and that is only just scratching the surface because there isn’t a member of the cast that isn’t delivering in a big way with their characters. With these performances mixed with the sets and costumes, it was unbelievably easy to become totally engrossed in this world. The most important part about Black Panther is the cultural significance it holds. The black demographic has been loooooong over shadowed by the white demographic and having this film—directed and written by black men, starring an overwhelmingly black cast, and centering on black characters—is a huge deal. Save your comment, white geek ready to “well actually” me and say that Blade was on the big screen before Black Panther. Yes, there have been black superheroes in the past but they have always been the exception and not the rule. Even worse, mainstream Hollywood has always claimed that films with diverse and non-white leads don’t sell. This movie is making stupid amounts of money and shows the flaw in that argument. 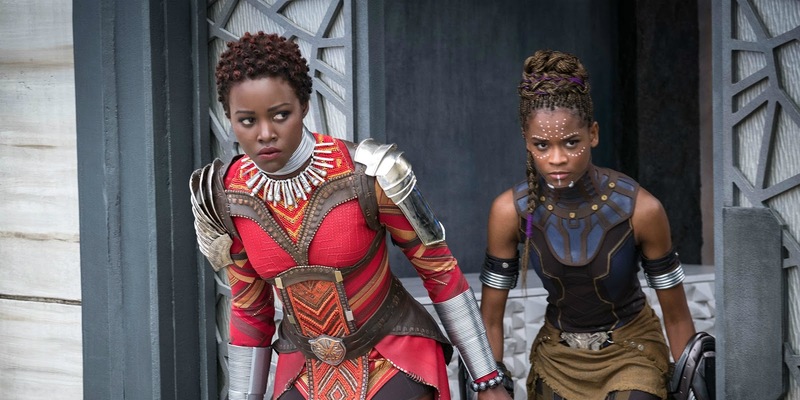 Even more empowering about this feature is the fact that it not only celebrates black culture through this superhero and is bringing about a mainstream black superhero to the underrepresented youths of the world, it showcases a strong female presence as it has nothing but smart and tough female characters. There’s no “damsel in distress” that Black Panther is trying to save. Nope. All the women are there guiding him and fighting alongside him in the name of equality. In a society that sometimes feel like we are going backwards when our President is saying disparaging things about all races (but won’t condemn the Nazis that are infecting our population) and brags about sexually assaulting women, this movie feels like the most progressive thing in existence and I love it for that. Black Panther is another win for the Marvel Cinematic Universe. The film is just an expertly crafted feature from beginning to end. The visuals are incredible, the sets and costumes are wondrously designed, the performances and cast are top shelf, the action is pure awesomeness and the story is filled with intrigue, heart, humor and drama. The movie follows the usual formula and beats you have come to expect with the MCU but it also breaks new ground by delivering a story that heaps on the social and political commentary, explores the importance of culture and even dives into the mysticism of the source material without trying to act like it is just a different kind of “science.” That was kinda lame when they made Asgardian magic “science” in Thor. Overall, Black Panther is just amazing!